With albacore season in full swing, it seemed like a good time to run this article, which I wrote last season for NW Palate magazine. 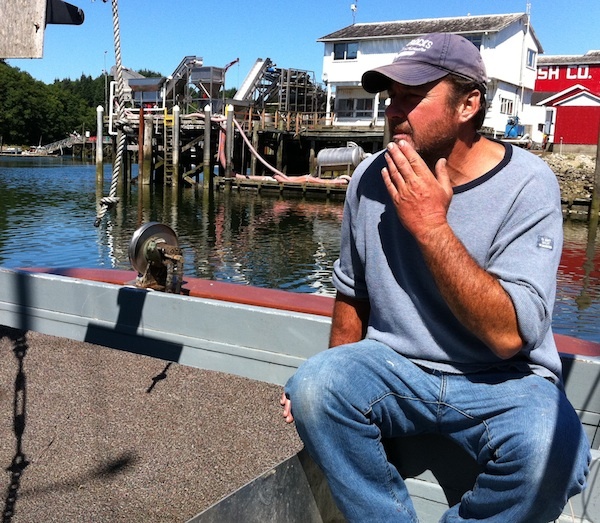 Wind off the ocean whipped through the rigging on his boat, and sea lions barked in the background as albacore tuna fisherman Rick Goché recalled growing up on Tillamook Bay on Oregon’s north coast. 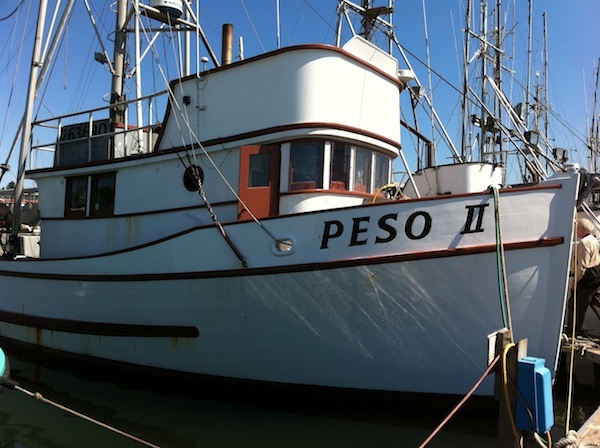 Rick Goché's boat, the Peso II. Goché grew up to be a fisherman; today, he fishes the Pacific Northwest’s deep, abundant waters, casting off from Coos Bay for two to six weeks at a time. It’s hard work, and definitely not child’s play. “When you’re a hundred, 200, 300 miles offshore, it’s not like you can duck into a port when the weather gets bad,” he says. His brother, Larry (below right), fishes with him, and his son, his daughter, and his grandson have taken turns on the boat as well. He has hopes that his daughter Lauren, who will be working on tuna boat this summer, may eventually take up fishing as a career. Larry Goché on board the Peso II. The average age of a fishboat owner is 62 (Goché is 57—“I’m one of the young guys,” he says), and the industry has had trouble attracting younger people into a career that not only is dangerous but also requires hard physical labor and long periods away from home. 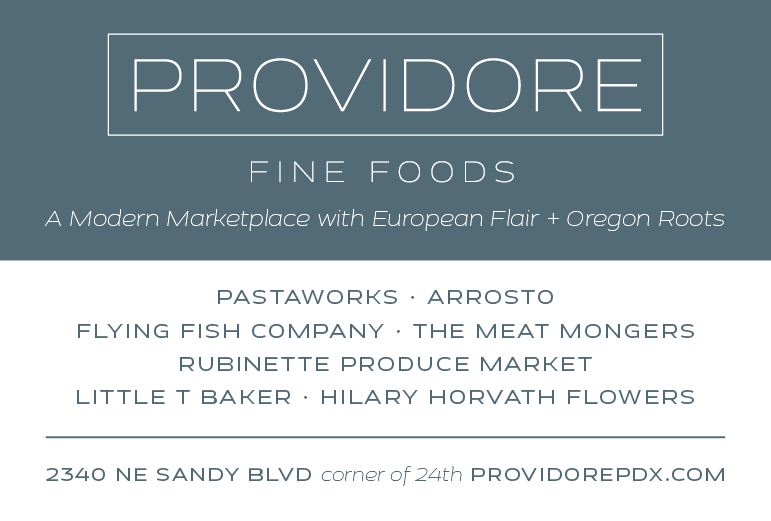 Another issue facing the industry is consumer awareness, a concern voiced by chef Eric Jenkins while he was handing out samples of hot-off-the-grill wild West Coast albacore outside a Portland-area Whole Foods market. “I’ve had a couple of people say they won’t eat fish because of the mercury,” he said. 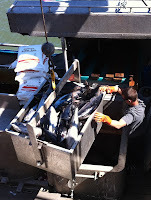 Unloading the albacore from the hold. The tuna most of us grew up eating in casseroles and sandwiches was probably skipjack, which is caught on giant factory ships that operate in the deep, tropical oceans of the world and is sold under brand names like StarKist, Bumblebee, and Chicken of the Sea. Nearly all of those ships are longline fisheries, which tow a fishing line several miles long with thousands of hooks baited at regular intervals along its length. The problem with this method is that it produces significant bycatch—meaning that it also hooks endangered and threatened sea turtles, seabirds, marine mammals, sharks, and other fish besides skipjack. The tuna caught in these deep waters are several years old and can weigh 40 to 60 pounds. They have absorbed mercury and other toxins, enough to cause the Food and Drug Administration and the Environmental Protection Agency to advise pregnant women, nursing mothers, and young children to limit their intake of the fish. Those warnings have caused big headaches for the West Coast albacore industry. That’s because the advisories don’t distinguish between the albacore caught in the deeper oceans and those younger and smaller tuna caught off the West Coast of the United States and Canada. Ranging in age from three to five years old and weighing 12 to 25 pounds, these younger albacore simply have not spent enough time in the ocean environment to contain the levels of mercury found in the larger, older fish. Heikkila is frustrated that so much of the albacore caught off our own coast is exported to Japan for sushi, and that Northwest foodies would rather buy a can of albacore tuna from Spain (produced, ironically, from West Coast albacore that is exported to that country) than albacore caught and canned on their own coastline. Fresh Oregon albacore just before it's sealed. What’s more, Northwest consumers are generally unaware that these local fish are caught one at a time using what’s called a pole-and-line or troll-and-jig method. This approach employs 10 to 15 lines of nylon cord measuring six to 100 feet long that are towed behind a boat. Each line has a barbless “jig” or lure at the end that is attached to a double barbless hook. When a fish bites the jig, the fisherman hauls it by hand into the boat, allowing the fishermen to keep only “right-size” fish and eliminating bycatch. 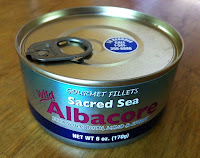 The Goché's Sacred Sea brand albacore. The U.S. and Canadian albacore fisheries in the North Pacific, made up of mostly small, family-owned boats like Rick Goché’s, received a boost last year when Seafood Watch, a program of the Monterey Bay Aquarium that evaluates the ecological sustainability of wild-caught and farmed seafood, listed U.S. and Canadian troll- and pole-caught albacore from the North Pacific as a “Best Choice” due to negligible bycatch and the healthy stock of albacore in the region. But the biggest shift in public awareness may come from the recent announcement by the Marine Stewardship Council (MSC), which has certified the Canadian Highly Migratory Species Foundation (CHMSF), an albacore fishery of Canadian-based boats, and the U.S.-based WFOA as sustainable and well-managed. And when they see the blue MSC label (right) in their grocer’s seafood case or on a can of albacore, “consumers can have the assurance that it is an environmentally responsible choice,” Coughlin said. 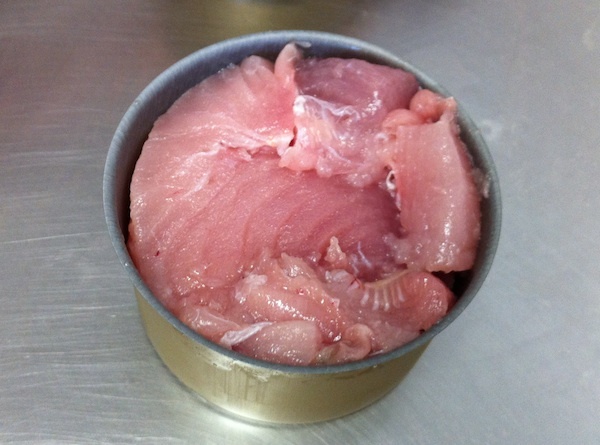 And, because they come from younger fish, the fresh loins of albacore available from July through October at most retailers contain more have more “puppy fat,” as an industry spokesperson called it. “I think it’s moister,” Jenkins said. “It seems to have higher fat levels, particularly concentrated in the belly.” His suggestion to consumers buying a whole loin is to ask their butcher to keep the belly meat on, adding that many butchers either keep it for themselves even cut it out, which he considers a travesty. Locally canned albacore would be almost as much of a shock to most shoppers. 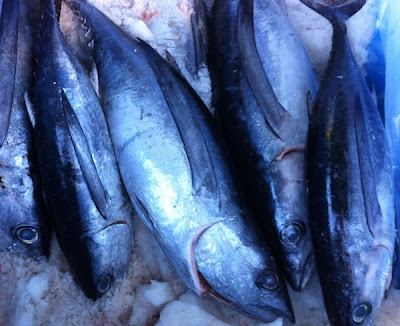 The major-brand tuna on their grocery shelves was caught and frozen at sea, then thawed at a cannery and cooked in big steamers, where it loses much of its natural juices and fats. It is then packed in cans and cooked again, requiring the addition of water or oil to keep it moist. That contrasts with most local tuna, which is packed in cans when it’s fresh and cooked only once, sealing in the natural juices and not requiring the addition of oil or water to keep it moist. Between MSC certification and a growing concern among consumers about where their food comes from, families that depend on the North Pacific albacore are seeing a brighter future for their children, and a way of life that they prize.